blooms during colder months. Its body is flattened and wide at oral end, compressed along tentacular plane. The meridional canals have lateral diverticules, connected or not with diverticules of the adjacent canal. Tentacles are totally absent in the genus. Specimens reach about 70 mm in length. 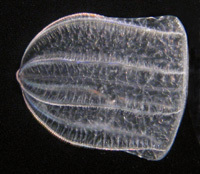 The species is originally from the eastern coast of Americas, although it was reported as an invader in the Black Sea, where it helped controlling the overpopulations of Mnemiopsis leidyi. · Dumont, H.; Shiganova T.A. & Niermann U. (2004) Aquatic invasions in the Black, Caspian, and Mediterranean seas. Kluwer Academic Publishers, Dordrecht, The Netherlands. 313p.